The perfect antidote to Valentines Day! Join us for an evening of songs that Shaw enjoyed, including popular music of his time, works by many of your favorite American Songbook writers! For this very special event, we’ll be returning to the original home of Project Shaw, the beautiful Players Club at 16 Gramercy Park South. We’ll bring you a sparkling evening of cabaret! Candles, Cabaret tables, Cash Bar, and an evening of songs performed by some of New York’s most exciting singers! Gilbert & Sullivan, Rodgers & Hart, Noel Coward, Cole Porter, with Operetta, Opera, Music Hall, and many of your favorites to sing along with! Though not commonly remembered, Shaw was an accomplished pianist and relished the popular songs of the day. Since he lived from 1856 to 1950 we’ve plenty to choose from! 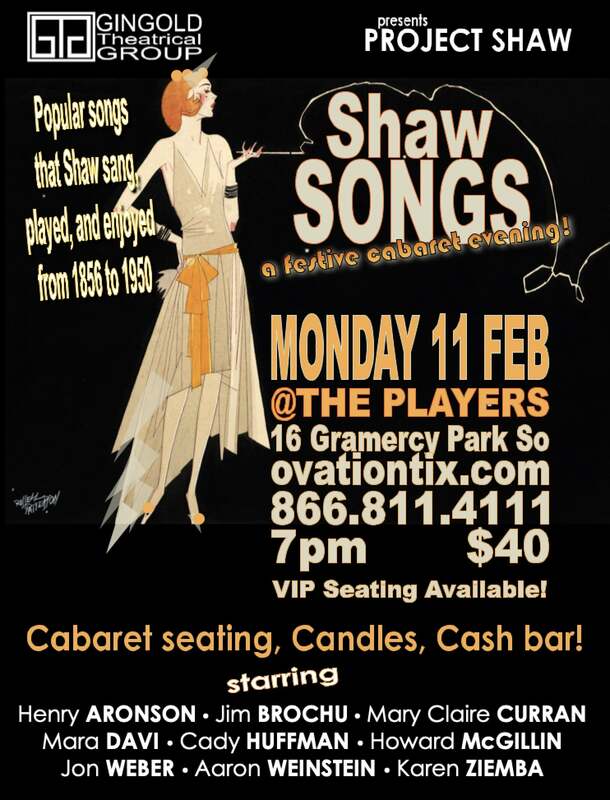 Last year’s Shaw Songs event was so much fun, we’re returning to The Players with another evening of popular songs. Nobody more relished the songs of the day more than Shaw (he not only enjoyed singing them but also playing them on the piano at social gatherings! ), and since he lived between 1856 and 1950 we’ve a golden wealth of material to draw from! For the price of our regular Project Shaw performance, you’re invited to a party. We’re also looking forward to being back in the legendary Players Club.